I got a big wake-up call a few months ago when Gretel hurt her back and was diagnosed with Intervertebral Disk Disease (IVDD). The thought of never being able to hike with her again scared me so I resolved to do everything I could to help keep her active and reduce the chance of re-injury. This effort involves many components but supplements are a big part of it. Before Gretel’s injury, I already had a list of supplements that are good for active and senior dogs. However, after she was diagnosed with IVDD, I did additional research to make sure I was covering all of the bases with their supplements. What Specific Issues Am I Giving My Dogs Supplements For? Chester and Gretel have always been active dogs. As with people, using your muscles and joints regularly can put stress on them. They need to take supplements that support high-energy activities such as hiking and paddleboarding and help in recovery afterward. They also need to maintain a healthy digestive system so they can properly absorb nutrients to maintain energy, strong bones, and muscles. They also have specific issues. Chester is 14 years old and, even though you might not know it by looking at him, is very much a senior dog. He has a touch of dementia that makes him restless and confused sometimes; he has accidents in the house now; and he has some weakness in his hind legs. Gretel’s specific issues are related to her spinal disease, IVDD. This degenerative disease makes her prone to future back injuries. It’s important to keep her strong, support her nervous system, and keep her pain-free. What Supplements Do I Give Them? After Gretel’s injury, I went a little nuts with the supplements. I gave her everything that I thought would help, which was about 20 things. After a while, I realized that some of the supplements had overlapping benefits. I didn’t think some others were doing much for her or were that important. In the end, I settled on the 10 supplements below. I consider these supplements high-quality and in most cases there is at least strong anecdotal evidence that they are effective for a lot of dogs, if not actual scientific studies. 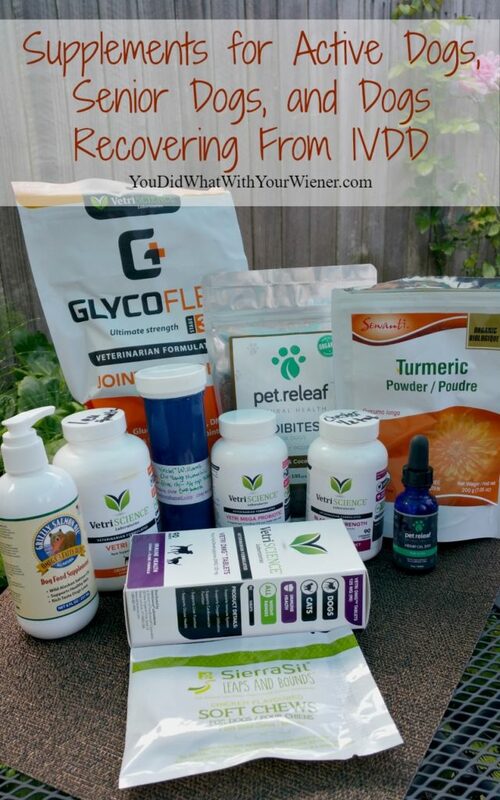 They’re all supplements that I think are good to give to active dogs, senior dogs, and dogs recovering from IVDD. Please remember that I am not a vet and I am not qualified to give advice to YOU about what supplements you should give your dog. I’m just sharing what works for us. Always check with your vet first before giving your dog a new supplement if you are at all in doubt. Note: many of the links below are affiliate links. This means when you click on a link and make a purchase, I will receive a few pennies to help maintain this website. We use Grizzly Salmon Oil™ , which is made from Wild salmon oil contains high levels of the Omega-3 fatty acids DHA and EPA, as well as Omega 6 and Arachidonic fatty acids. These components not only support healthy skin and coat, but also cognition, vision, and other nerve-based functions. Note: if you give your dog oil primarily to improve their skin and coat, the Grizzly Wild Pollock Oil (which contains high concentration of EPA but very low DHA) is significantly cheaper. There are a whole slew of good things this ground root can do for your dog but the two biggest are reducing inflammation and pain associated with aging and damaged joints. Turmeric has been found to be more effective if it’s turned into a “golden paste” first. The recipe for golden turmeric paste I use calls for turmeric powder (make sure you use organic), pepper, and coconut oil, which has its own health benefits including improving skin health, aiding in digestion, and helping with arthritis or ligament problems. Check out the other benefits of turmeric HERE. 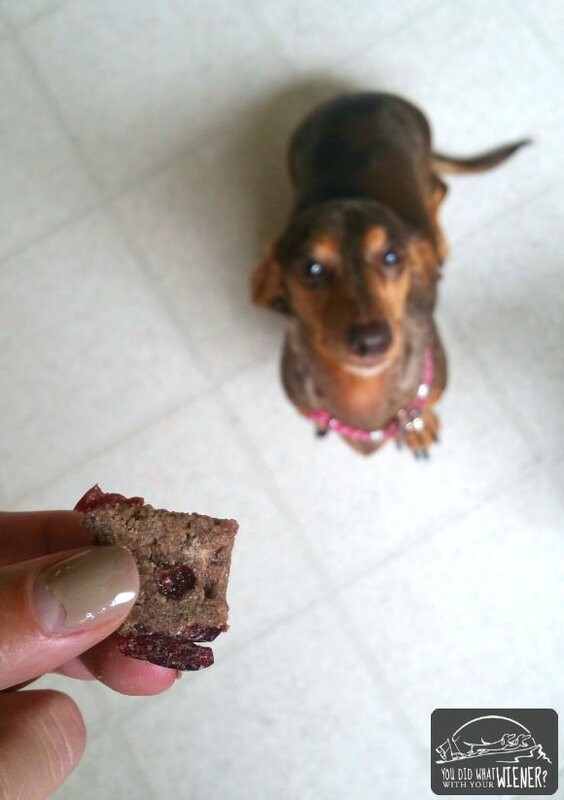 I give my dogs VetriScience® Vetri Disk to help support spinal and cartilage health. It combines bovine tracheal cartilage with amino acids, mineral sulfates, vitamins, pepsin, and natural silicon sources to help support and maintain connective and disk tissue. This is probably the supplement I vary the brand of the most. I generally stick with one regular joint supplement and rotate the others in occasionally for added benefits. There are several high-quality supplements that I trust and I think that rotating them, along with any others that sound promising, gives Chester and Gretel added benefits (because each one contains a little something different or varying amounts of the best stuff). Our go-to joint supplement is Glycoflex Plus (you can read more about Glycoflex Plus here). Other favorites are ActivPhy Joint and Phycox Canine Joint Support and SierraSil® joint formula for dogs. SierraSil joint supplement is a little different than most because it uses a naturally occurring hydrothermal clay complex that helps reduce inflammation and pain, and provides cartilage support, instead of Glucosamine. CBD for pets is all the rage right now. It is touted as somewhat of a cure-all. CBD is derived from industrial hemp and contains almost no THC, the compound that produces a “high”, so it’s safe for dogs (it’s even been found safe in really high doses). Benefits of CBD for dogs include reducing inflammation, reducing pain, increasing muscle repair after strenuous exercise, reducing stress and anxiety, and increasing cognitive function. I’ve tried over 10 different brands of CBD for dogs with Chester and Gretel. The two that work best for them are from HempMyPet (the one we currently use) and Pet Releaf. I give them the CBD oil daily and boost those with the CBD treats if the dogs are acting particularly anxious or went for a strenuous hike. Chester and Gretel get the VetriScience® Vetri Mega Probiotic with their food daily. Vetri Mega is a non-dairy probiotic produced from an all-natural source of beneficial microorganisms and it includes prebiotics to support digestive tract health. It’s recommended for normalizing digestion, coping with food intolerances, supporting regularity, and gastrointestinal, immunological and neurological support. While I don’t do it every day, I periodically add Bragg Apple Cider Vinegar to their food. There are a lot of benefits to giving your dog apple cider vinegar like aiding digestion, helping with gas and constipation, and helping with joint problems and arthritis. It’s important to use apple cider vinegar that has the “mother” still in it. The mother is the dark, cloudy substance in the apple cider vinegar that contains some of the best parts of the apple. Vinegars with the mother contain enzymes and minerals that other vinegars may not contain. Bragg apple cider vinegar is pretty much the “holy grail” of healthy vinegars. I give my senior dog Chester VetriScience® Bladder Strength in hopes of helping him have less accidents in the house. Bladder Strength for Dogs contains pumpkin seed powder, Rehmannia glutinosa, wild yam extract, saw palmetto, and olive leaf extract. The combination of these ingredients supports normal hormone levels, renal function, bladder muscle strength, and normal bladder tone in spayed or senior pets. On days we hike or during prolonged periods of high activity (like my 3-day backpacking trip with Gretel), I give them a VetriScience® Vetri DMG. DMG, an adaptogen that helps the body cope with various forms of stress, supports immune system function, helps maintain healthy circulation, increases oxygen utilization, decreases lactic acid build-up, and improves performance/stamina. I know that sound like a lot of stuff. As you can see in the video above, I just mix most of it in with their food at breakfast or dinner time. Now that I have a routine down, it literally only adds another minute or two to what I’m already doing. However, I DO feed them raw food so it’s super easy to mix in with their meal. If you feed kibble or freeze-dried raw, you may have to get more creative. Are These Supplements Good for People Too? Doing all this research for the dogs made me take a second look at what I was and wasn’t taking. It turns out that I was doing a better job at taking care of Chester and Gretel than myself. I found that many of the supplements I give them could help me with similar issues. For example, I have really achy knees. I took ibuprofen almost every day. I knew that wasn’t good for me but I didn’t know what else to do. I heard such good things about turmeric helping reduce joint pain and inflammation that I decided to give the natural route a try. After only a month of taking turmeric capsules (only the ones where the powder was mixed with olive oil – New Chapter Turmeric Force – worked for me), I no longer felt the need to take ibuprofen! Whew! Did you make it to the end of the article? There was a lot of information to cram in there. I hope you found some of it helpful. Do you or your dogs take any of the supplements that I listed? What do you think? I adopted Wilson 10 years ago when he was 2 and found out later he had been diagnosed with disc disease. He had 1 episode shortly after being adopted where his hind legs just seemed to give out. I crated him for approx. a month and on the advice of my vet and a very nice lady in the waiting room who also had a doxie I started Wilson on Vetri-Disc. I give him one each day wrapped in a pill pocket or peanut butter. I also sprinkle a teaspoon of Missing Link with glucosamine on his dinner. Wilson also has a ramp to his chair and a Hound-About bike trailer/stroller–He is a little wobbly on his back legs– but has never had another episode where he was unable to walk nor does he ever seem in any pain. Definitely happy with the Vetri-disc. I’m glad to hear you’ve had success with it. What a great, informative post! Anyway, I have a question…because back problems can be very severe and are common in Dachshunds, how can back problems be prevented? I have a very active and healthy 2 year old miniature smooth Dachshund and though I don’t let him jump off couches, beds, or down the stairs (he can go up stairs without falling though) but what are some other ways to prevent back problems? The bottom line is, most Dachshund back injuries are brought on by Intervertebral Disk Disease. It’s genetic so there isn’t any way to prevent a back injury if your dog has it. That being said, you can certainly hope to delay and effects and minimize injuries when they do occur. The articles above will tell you about the disease and what you can do. 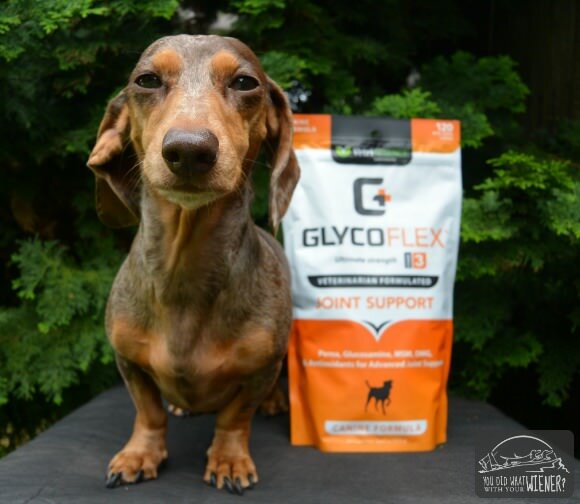 We’re big fans of GlycoFlex and fish oil around here! The bottom line though is that I feed them a variety of raw foods. Some of our favorites are Nature’s Variety Instinct Raw, Vital Essentials, and Darwin’s Naturals. I cannot even begin to tell you how happy I am that I found this blog! I live in a rural county where most dogs sleep in the mud out back and people look at me like I’m a crazy person because I do so much for him…I think I need to move to Seattle haha! I use Bonnie&Clyde fish oil – its a combination of fish plus sunflower seeds…”The Missing Link” supplements which I plan on switching to Nupro, golden paste, and I make a batch of bone broth every month. I also puree green smoothies and freeze into ice cube trays or I make an orange smoothie which consist of carrot, apple, ginger, and turmeric. My dog is my entire world – hiking partner, mountain bike chaser, therapist haha…Thanks for starting this blog! Awww… thanks Jess! I’m glad you are so active with your pup. I do experience a bit of culture shock when I travel away from the west coast. I forget that a large oprtion of the country doesn’t treat their dogs like children. Hi, have a mini dachshund of 8 years having some problems with several discs in her column, not surgery yet thanks God. I give her a daily supplement of glucosamine and MSM Phycox, sent by her vet, but I’m worried because every few months she keeps showing problems in new discs. I see you give your dogs Vetridisk with very good reviews on Amazon. I know you are not a vet but would like to know if you use this last product on a daily basis in conjunction with the other ones? Can it be used as a preventative to help my dog avoid major IVDD problems or is it just to be used in extreme cases? Thanks so much. Hi Carlos. Yes, I give my pups VetriDisk along with their other supplements on a daily basis. To me, it’s like glucosamine. You can’t prove that it’s working but you hope it does and the ingredients are knows to help build cartilage and/or keep it healthy. It’s just a supplement without studies (not that I’ve found anyway) so no medical claims can be made. Again, like glucosamine, it’s something that might help but it’s in no way considered a fix to “avoid major problems”. My hope is that it will help keep Gretel’s back healthy and help any further incidents to be less frequent or less severe. Something major could very well happen in the future though even with the supplement. If it doesn’t’ happen, I’ll never know for sure if the supplement helped or if it was just luck. Make sense? Any updates on how you are liking Sierra Sil Leaps and Bounds supplements? Hi Cheryl. Sorry for the delay in getting back to you. I’ve been sick with a cold. We were only given a 7-day trial sample of the SierraSil for each dog. I think I wrote this article before we were done. We finished the 7 days and, like most other joint supplements, I didn’t see a “huge” difference. However, I never do. Gretel doesn’t have any visible joint issues and any weakness Chester has if very mild (hard to believe at 14, I know). I’ve learned that one doesn’t see a “huge improvement” if there was really nothing to improve in the first place 🙂 When we ran out, we went back to the GlycoFlex plus. That one is my favorite. If I was going to get something else though, I would definitely try the SierraSil again. I’ve even considering giving them both – alternating days. I’m a true believer in helping an issue with multiple products (to “cover the bases”) since they contain different ingredients. I went ahead and ordered the Sierra Sil and looking at alternating with the Glucosamine and Chondroitin as well. I’ll keep you posted ! My male had some back issues and I bought those same scalloped steps. Thanks for a lot of great info. Hi have you ever tried any thermal therapy products like back on track ect to help with stiffness and cirulation ? im looking in to getting a thermal therapy mesh coat and leg wraps for my dashound she has elbow dispalysia and arthritis i have seen lots of good reviews but was wanting to know if you have tried it or heard any good things about it with people you know ? I have not. I got acupuncture and laser treatment for Gretel though.I don’t have faith that products like back on track would work well for us – both because I doubt they would be more effective than the accupuncture and laser and that Gretel would not like to wear it. Hi Rebecca. I have not tried that product. I hear it’s very popular in the agility field for keeping a dog’s muscles warm and flexible between bouts of exercise though. It’s not very useful for my application though because all it does is keep muscles warm. I wanted something that could help with pain and inflammation (reduce and potentially lessen). I found cold laser therapy to be much more useful. I got many treatments at our veterinarian during Gretel’s rehab for her back injury. Now we have a home unit. This is the laser I have: http://www.laser-riffic.com/MY-PET-LASER-PROGRAM.html My rehab vet did recommend something that is used more like the thermal therapy but is considered laser therapy. It’s cheaper than a cold laser home unit but I didn’t have as much confidence in it. This is what she recommended though: http://equinelighttherapy.com/shop-online/. Good luck. My 4 year old French Bulldog just had surgery last week for a herniated disc in his neck. He has multiple thoracic hemivertabrae and IVDD. The ER vet said there is a 15-25% chance of a recurrence but that there were no supplements or anything that could be done to help with these issues except for minimizing stair use and jumping on/off furniture. I am in the Seattle area also and over the weekend bought some CBD Hemp Oil. Some of the supplements you mention sound promising and I think I might order a couple on the chance that they will help. I was also wondering if acupuncture and/or laser therapy would help. Thank you for your response! I am trying to learn all I can about this disease and your blog has been very helpful, especially the post “Do You Need to Treat Your IVDD Dog Like Breakable Glass?” I don’t want to live every day in fear that something is going to happen again. I am definitely going to give some of these supplements a try. And I just looked and my vet does do acupuncture and laser therapy! So once Jax has fully recovered from his surgery, I am definitely going to make an appointment with his regular vet to discuss options. You mentioned Chester being weak in the hind legs. My doxie, Sebastian, before he passed, was weak in the hind legs In fact, he was lame. I read where serratiopeptidase (an enzyme made by the silkworm) would help but it would take a couple of months. I bought some off Amazon and gave it to him, and almost exactly in 2 months, he was up and walking like normal. Just FYI. Thank you for this site. Very informative. I have an 8-year old pup 3 1/2 weeks into conventional treatment for a herniated disc. He’s on muscle relaxer and NSAID now. I’ve ordered and received CBD product for him but am unsure if I can give it to him while he’s on his meds or should wait till he’s off. Any advice? I would check with your vet. It’s my understanding that CBD does not interfere with the effectiveness of most medications but I think it does a few. I don’t know what those are, sorry. Hello ! HANK YOU SO much !! Our Winnie dog is 8 and we do have a lot of stairs up the bedroom.. like 12! I am not clear if climbing stairs is bad for his back or is it the jumping on and off furniture . Any advice to keep him as injury free as possible . The jumping is definitely the no-no. Gretel has IVDD so I don’t like her to jump at all but before I knew my rule was no higher than her body was long (because them it was more like a step down than a jump). We literally have a fence around our couch, and piles of pillows on the chairs, so she can’t jump on them (the couch does have a gap in the fence with a ramp). Stairs are ok in most cases according to our rehab vet in most cases (but I would ask your own vet if you are concerned). Going UP the stairs can actually build strength. It’s the down that has the most impact on their joints and when they are most likely to fall and twist their neck/back, which is the real danger. In any case, a fit, healthy weight and keeping him strong through exercise, are the best ways to prevent back injuries.